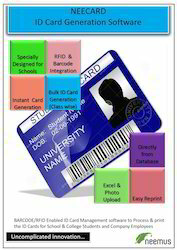 Nee Card is a Bard Code/RFID enabled smart and effective ID Card Printing and Management software which enables the schools , Colleges and corporates to print and manage the ID cards for their students and employees. The Project “ID CARD MANAGEMENT SYSTEM is a windows application which is developed to generate an ID Card for any school or Institutions. The application developed in .NET technology. Instantly print professional, secure ID badges with this simple to use software. TrustID is cross compatible with any stand-alone or networked ID card printer, allowing users to easily design and print cards of any sizes. TrustID is available in three versions to suit your budget and security requirements. Supported by the team of skilled and well educated professionals, we are involved in offering a wide range of ID Card Softwares to meet the needs of our clients. Without overwhelming extra features, these focus on the simple as well as complex IDs. Last but not the least, we are offering our range at industry-leading rates.